In a recent story by Reuters, Facebook recently removed 32 fake pages and accounts from its sites that the company alleges were engaged in “coordinated inauthentic behavior”. media’s narrative of “Russian meddling”, but shows a very disturbing cover-up by the social media giant. According to interviews conducted by Internet Deputy, a large number of Facebook community administrators say that there are literally thousands of fake profiles trying to infiltrate their platform. Every day individual sectors of the massive site discover up to hundreds of accounts posing to be someone or something they are not. The interviews were conducted under condition of anonymity as community administrators fear reprisal from department heads at Facebook. In addition, Internet Deputy spoke to a Facebook employee, who for obvious reasons, also wanted to remain anonymous. The social media company has a long documented history of punishing whistle-blowers for exposing the inner workings within the organization. Read: Facebook Kills Alex Jones Pages But Not Antifa! The administrators say that the fakes attempting to infiltrate their communities seem to be trolling the platform or are connected with Islam in some way. While the aforementioned article by Reuters claims that the “Russian” fake accounts are getting better at disguising themselves, the truth is Muslim fake accounts have been ramping up their attempt to appear more authentic—as Americans and Russians. The basic “troll” accounts essentially join a community and either do nothing or try to appear “part of the group” by creating generic posts unique to that forum. However, they seldom actually troll individual posts, preferring instead to report posts to Facebook as violations to the “community standards” department. Some trolling accounts come from employees within the Facebook company itself. In 2017 the company announced that it was hiring 3000 employees to help “monitor content”. It is now known that some employees are tasked with creating fake accounts in order to spy on other accounts as well as entire communities. Once a post has been reported, Facebook then blocks the post and pulls it, not just from the community where it was reported from, but also from other locations where it has been shared recently. At that point the unsuspecting user who made the post will be punished by Facebook. The punishment can range from the user from being prevented from posting into any group for a specified amount of time (usually 10 – 15 days)to outright banning from using the platform entirely. The harsh punishments handed out by the social media giant provide absolutely no way for a poster to defend him or herself. Users are sent a message explaining the ban with a button labeled “appeal”, but regardless of what the person claims, Facebook never allows the ban to be ended before the predetermined end date. In fact, unless the person blocked is extremely high-profile, Facebook never contacts users to discuss restrictions. One administrator who had built a community to over 500,000 members was banned so many times that Facebook kicked her out of the group she founded and opened it up for anyone to join. This created a fiasco for many of the unsuspecting members who were repeatedly punished due to trolls on that particular group. The fake Muslim accounts are more worrisome in that they are joining and friending specific types of communities and people. Their accounts are well disguised and, in spite of only having a day or two active, have figured out how to make it show as if they have been on the platform for many years. 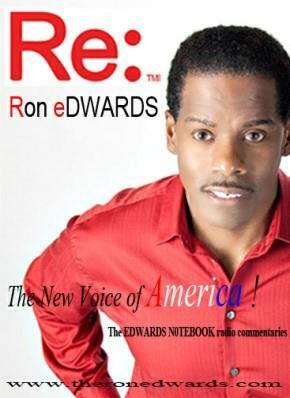 While generally not religious in content, her community is a Christian related group and espouses American values. But hers is not the only group that gets numerous fake accounts. In fact, every single one of the80 groups reviewed has the same issue of being infiltrated by Muslim accounts. Some administrators have noticed a recent trend that is, perhaps, even more alarming. As one man who heads a group of approximately 130,000 noted, “Now I have been seeing more and more of these fake Muslim accounts but intentionally appearing to be Russian”. 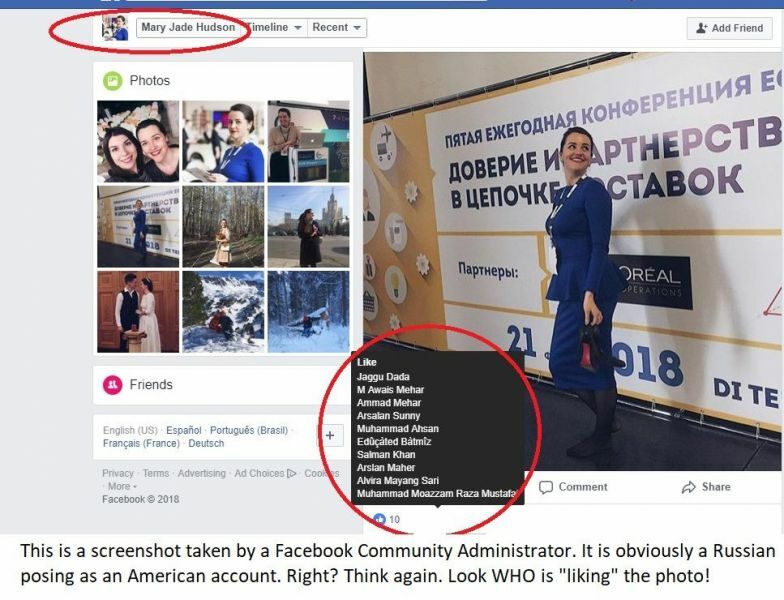 According to this administrator, the profiles are written in Russian and intentionally look like a fake Russian account, but once again a review of the list of “likes” on personal photos reveals almost solely Arabic names. 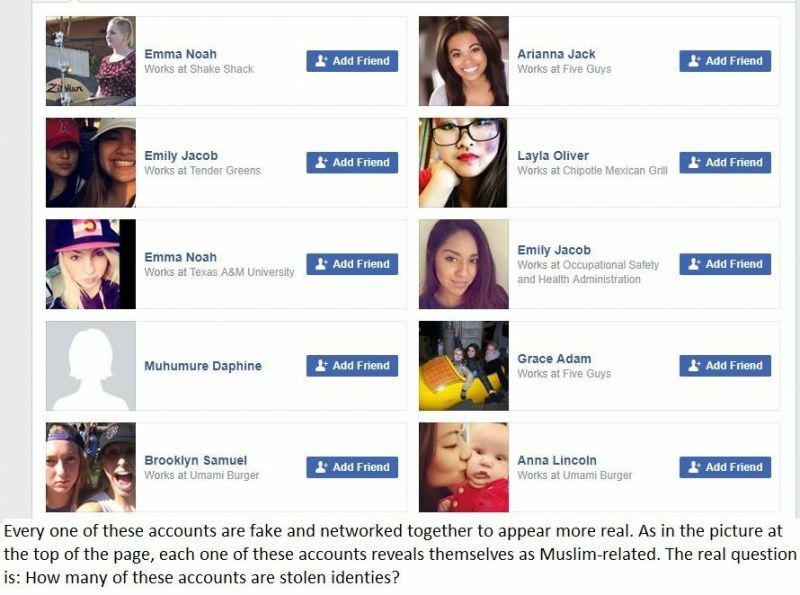 It is known that most of these Muslim profiles are fake users, but the anonymous Facebook employee provided a secondary, and perhaps more troubling explanation. The employee is somewhat of an inside-observer with several employees of the company. He is a Pakistani employee who works with many Muslims among other staff members. According to him, the Facebook Muslim community tends to keep to themselves more than other groups. “They think that they (employees)all have the same things in common, but unless it is completely work-related, you won’t see the Muslims mingling with the other staff members”. According to him, algorithms alert employees to some of what gets flagged, but most of what gets users’ posts blocked or pulled are “community standards” violations reported by other users who are mostly trolls from both inside and outside users. “I really wish I could tell you more about how it is all done, but I can say for sure that employees are probably [the]biggest cause of problems.” He explained, not wanting to reveal too much information. He went on the say that the Muslim employees also did this, but would assist outside Muslims look like authentic American accounts, for “other purposes” which he did not expound on. He did, however state that while the other employees were diverse in their networking, the Muslims tended to only network with other Muslim accounts. “I really can’t say too much about it because I don’t want to lose my job, but I can tell you I have talked [to] some of these people and they not good” claimed the insider. As the 2018 mid-term campaigns in the United ramp up, it is expected that the mainstream media will certainly continue to perpetuate the “Russian election meddling ” narrative, but in reality it is no more than a propaganda piece with which to attack President Donald Trump and the Republican Party. Sadly, CNN, MSNBC, ABC, The New York Times, and other mainstream outlets will not report on the actual attempt to shut down speech while they falsely attack President Trump for the same thing. Even more disheartening is the potential harm to American lives that could be caused by the aforementioned report. Thus, it can be assumed that the mainstream media is not interested in protecting U.S. Citizens, but rather advancing their agenda even if it means lying to them.